During the latter half of the 20th century, there was no gold bullion coin more popular than the South African Krugerrand. Once the standard of the gold bullion market, the Krugerrand has seen its profile dip as coins such as the American Gold Eagle and Gold Canadian Maple Leaf rose to prominence on the precious metals market. 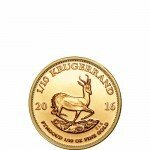 Despite the competition, the Krugerrand remains one of the most popular gold bullion products in the world today. Now, you can own a 2015 1 oz Gold South African Krugerrand in brilliant uncirculated condition, from Silver.com. Each of these coins contain one troy ounce of pure gold. Contains 1 oz of .9167 fine gold. Features the famous antelope design. 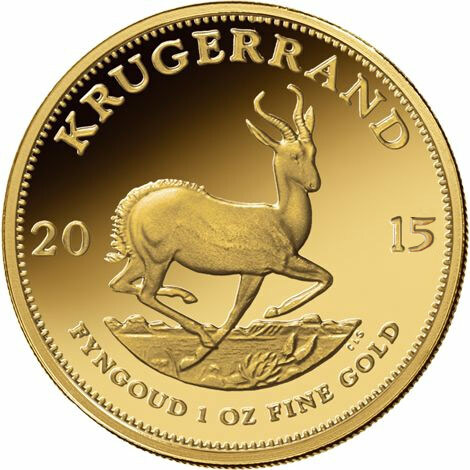 The Krugerrand was first struck in 1967 to help market South African gold to the global precious metals market. 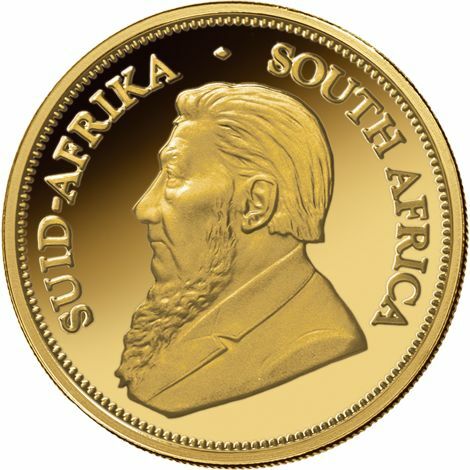 The coin took its name from the combination of Paul Kruger, whose image is shown on the obverse side of the coin, and rand, the unit of currency used in South Africa. Kruger was the first elected President of the South African Republic, a post he would win reelection to four times. He is credited with leading the Boer resistance against British attempts to control South Africa. On the obverse side of the 2015 1 oz Gold South African Krugerrand is the left-profile portrait of Kruger. His image was designed by Otto Schultz, and engravings on this side include “Suid-Afrika” and “South Africa.” The former is in Afrikaans, while the latter is in English. The reverse side of the coin features a native springbok antelope running through a field. Engravings include “Krugerrand,” the year of minting split on either side of the antelope, and the weight, purity, and metal content of the coin below. If you have any questions about the 2015 1 oz Gold South African Krugerrand, or the online purchasing process before placing your order, don’t hesitate to contact our associates at 888-989-7223. You can also reach out to us online using our live web chat feature.